The FTSE 100 index celebrated its 30th birthday on the 3rd of January 2014, my, hasn’t time flown! The index in fact reached its all-time high roughly halfway through its life to-date, while in its 16th year of existence in 1999. The annual compound return achieved at that point was around 13% per year. In the fifteen years since the index has halved and doubled twice, and now stands very slightly lower than it did in 1999 (albeit an investor would have received dividend during this time which would have given the investor a higher return than what is represented on the chart). The index experienced its best year in 1997, with a gain of more than 24%, and its worst in 2008, with a loss of over 30%. 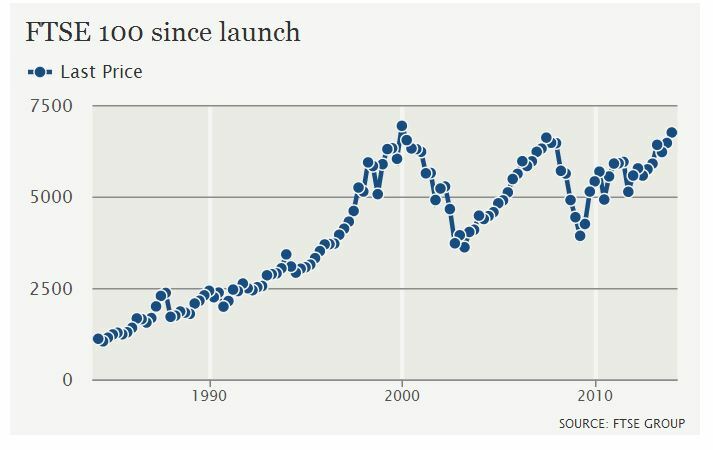 This Telegraph article details some of the highest daily rises and falls (although also quotes a miscalculation on the average return, by taking the arithmetic, as opposed to geometric, average). What’s also quite interesting, as an indication of how the UK (and global) corporate and financial landscape has changed is to look at the constituents of the index then and now. There are 30 of the original 100 constituents still surviving in the index, and 19 of these have survived continuously (these include names such as Barclays, Shell, British American Tobacco and GlaxoSmithKline – after all you can always rely on banks, oil, guns and drugs, right?). Mergers and acquisitions over the years do complicate the picture in a number of cases with a larger number of smaller banks and insurers appearing in the list that have since merged (Midland Bank, NatWest and Bank of Scotland, for example). We also see the changing face of the UK’s high street indicated, with British Home Stores and House Of Fraser appearing in the original 100. Then there are a few original names that appear to be from a totally different time, and indicate the changing face of British Industry: English China Clay, Associated Diaries Group and Pilkington Brothers (a glass manufacturer subsequently taken over by a Japanese company). The FT Alphaville Markets Live chat had more interesting detail on this. In conclusion, its hard really to imagine a time when we didn’t have the FTSE as a benchmark for the UK equity market and certainly indexation was a massive innovation which totally changed the investing landscape. In fact index continue to evolve and are essential building blocks and benchmarks for new investment strategies such as volatility controlled or low volatility equity, or risk parity. However looking back over the FTSE’s history also shows us how volatile and risky even a passive investment in the largest companies in the UK can be.